Without beating around the bush here's the information you've been so patiently waiting for. For Alpha backers the wait will be over in less than a month. Planet Nomads STEAM store page's ready and approved by Valve. We've nearly had the dev-build approved on the first go! Sadly there was one issue with the Linux build. Martin D. already fixed this hiccup and Little Kuba sent a new version to STEAM. It should get approved any day now. Alpha backers will get their STEAM keys via e-mails on 25th August and may immediately add Planet Nomads to their STEAM libraries and play. This activation of Planet Nomads is for life and covers Early Access too. Though it may seem like the alpha is ready, we're still tinkering a thing here and there, like adding simple tutorial for building and polishing visuals of the biomes. Then a couple rounds of build/testing/bugs/new build and then it's off to you, Nomads. As covered in Nomadic Journals Ep. 3, the alpha will feature a creative mode with unlimited resources, immortality and a suit with hi-tier jetpack. It will be available for Windows and Linux, and hopefully MAC once we figure some performance issues on this platform. Now to the other part of this announcement! We've tested Planet Nomads on a limited number of rigs, so please take the requirements as a general benchmark of Planet Nomads performance. This doesn't mean they are way off, just don't ask us about specific hardware configurations yet, as we don't know at this point. If you are not sure whether your specs are fit for the job, try some Googling and comparing their performance with the above listed specs. Or head on to Planet Nomads forum and ask fellow Nomads for their opinion. 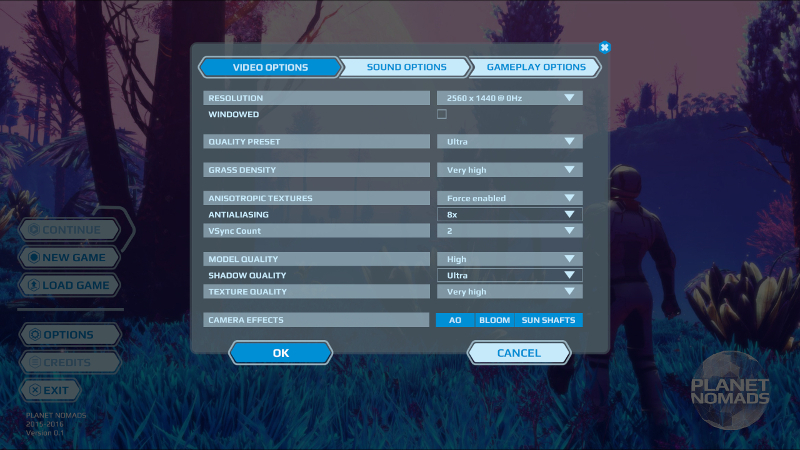 Furthermore the alpha already will have options to customize the graphics to fit your rig as best as possible. The above-mentioned minimum requirements run the game on Medium settings at around 30 FPS so there's probably still some wiggle room left, but we wanted to be rather safe than sorry, and only with real life play-tests and stress-tests will we know for sure. So pencil down the 25th August to your calendars. Planet Nomads is coming and we're eager to hear from you.